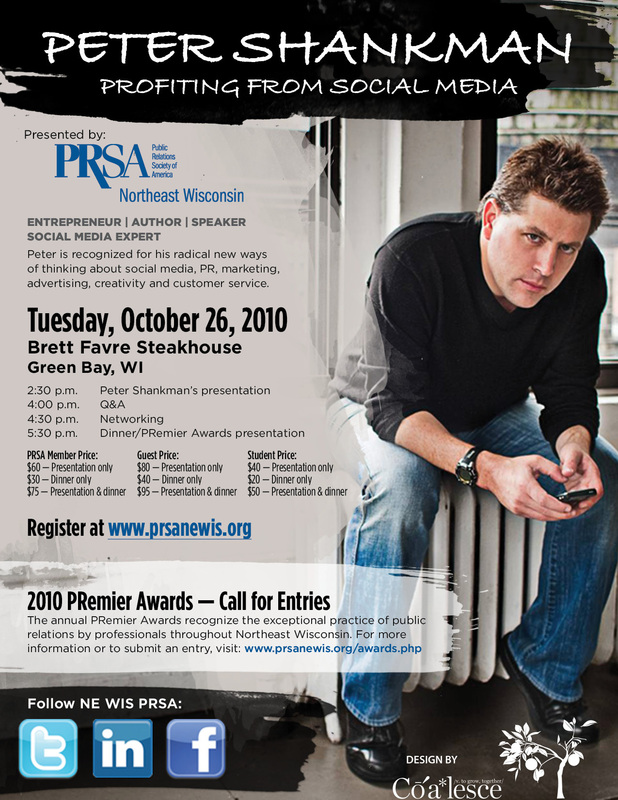 The Northeast Wisconsin Chapter of Public Relations Society of America will hold its 10th Anniversary Annual Meeting featuring PR Celebrity Peter Shankman at 2:30 p.m. on Tuesday, October 26, at Brett Favre Steakhouse, Green Bay, WI. The event is open to all communication professionals. Shankman’s 90-minute speech will focus on how companies, agencies and others can use social media to generate revenue. Shankman is a former journalist, turned public relations professional, turned entrepreneur who is recognized worldwide for his new ways of thinking about social media, public relations, marketing, advertising, creativity and customer service. He is most well-known for founding Help A Reporter Out (HARO), which connects thousands of journalists to sources around the world looking to be quoted in the media. According to his website, HARO is currently the largest free source repository in the world, sending out more than 1,200 queries from worldwide media each week. HARO’s tagline, “Everyone is an Expert at Something,” proves over and over again to be true, as thousands of new members join at helpareporter.com each week. The site currently connects 102,829 active sources with 29,478 journalists. Shankman is also the founder of The Geek Factory, a boutique Marketing and PR Strategy firm located in New York City. Peter is the author of “Can We Do That? Outrageous PR Stunts That Work — and Why Your Company Needs Them” (Wiley and Sons 2006) and a keynote speaker at events worldwide including The Affiliate Summit, South By Southwest, The Public Relations Society of America, The International Association of Business Communicators, Mobile Marketing Asia, and the Direct Marketing Association. He was also named one of PR Week Magazine’s “30 under 30 to Watch”. Fee and registration information is available at the PRSA-Northeast Wisconsin website! The first annual PRSA Northeast Wisconsin PRemier Awards will recognize the exceptional practice of public relations by professionals throughout Northeast Wisconsin. For more information or to submit an entry, visit: www. prsanewis.org/awards.php.